There are two important things that my husband and I make sure we have in the house at all times. That’s Sriracha and Tapatio hot sauces. If they start running low our house falls into panic. We make sure it’s always on the list of “need-to-buy-and-bring-back-from-the-US-to-Shanghai-or-else-I-can’t-survive” items we pick up whenever we visit home. (FYI, I saw they’ve now stocked Tapatio at City Super and Sriracha at GL Japan Plaza in Shanghai in case you’ve made the mistake of not getting some for yourself or are running dangerously low). When I was little, my Mom never needed to shake her finger at me and say, “Eat your brussels sprouts!” since I’ve always liked them. I’ve always liked spinach too. This, however, is my most favorite way to prepare brussels sprouts. I do like them plainly pan seared with olive oil and salt & pepper but adding a few squirts of Sriracha and lime really gives it a special flavor: tangy, sweet, spicy, salty, buttery and a flavorful char when seared for the right amount of time in the pan. Try. It. Out. 2. With a knife, trim the hard, woody ends of the sprouts, then slice in half lengthwise through the core. 3. Cut the bacon into small chunks and cook in an ovenproof skillet over medium heat till crispy, about 5 minutes. With a slotted spoon, transfer to a paper-towel-lined plate. 4. Drain most of the fat from the pan and add the sprouts, cut-side down. 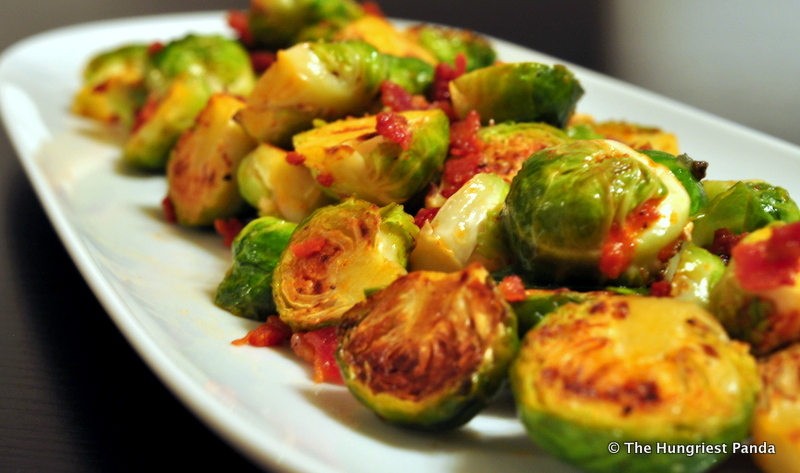 Raise the heat to medium high and sear until the sprouts begin to sizzle. Put the skillet in the oven and roast until the sprouts are deeply browned, 8 minutes or so, then shake the pan to redistribute them and flip them over. Pull the pan from the oven when the sprouts are bright green and fairly tender (taste one to check), about 10 minutes more, depending on how large they are. 5. Return the pan to the stovetop over medium heat. Stir in the bacon and, if you want, a pat or two of butter. Swirl till incorporated. 6. Place in a bowl. Add a few squirts of Sriracha hot sauce, depending on how hot you like it, and a squeeze or two of fresh lime juice. Season with salt and pepper, if necessary. Serve with anything.